Practical guide covering fundamentals of database searching technique. If you are new to searching databases for scholarly sources, this is a good place to learn. The purpose of this guide is to acquaint new (or rusty) searchers with the fundamentals of database searching. This guide is divided into help tabs which focus on specific (basic) methods for finding resources in databases. 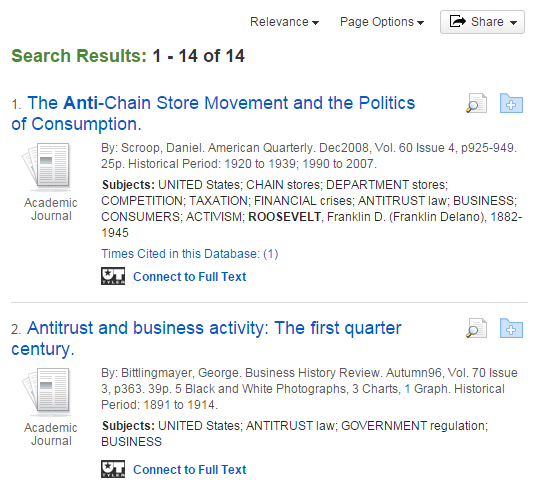 Use the tab headings or embedded links above to navigate to a specific topic & then explore in detail. Use the adjacent glossary to navigate any unfamiliar terms in this guide. • Scroll down the alphabetical list until you find your term definition. • Glossary terms used in the guide will be flagged with italics where they appear in the tabs. 1) Targetted searching - searching to retrieve "known" items of interest (e.g., works of a specific author or about an author, a specific article or book). 2) Discovery searching - searching to find out what is available on a topic and retrieve relevant items. Most databases come equipped with tools to aid both types of searching. 1. discovery - its existence makes an item's content searchable (and therefore, 'findable') in a database. 3. access - the record functions as platform address where the item's full text is available. Where it isn't full text accessible, the record normally links to interlibrary loan services where the item can be requested. Index Field - an information storage and retrieval address, within a database record, where specific bits of content are saved to increase the record's searchability. Index fields greatly increase the searchability of a database by permitting pinpoint searching for specific pieces of information across the database. In the above example, searching the Authors field will retrieve all articles published by Dr. Yukawa, indexed in the database. 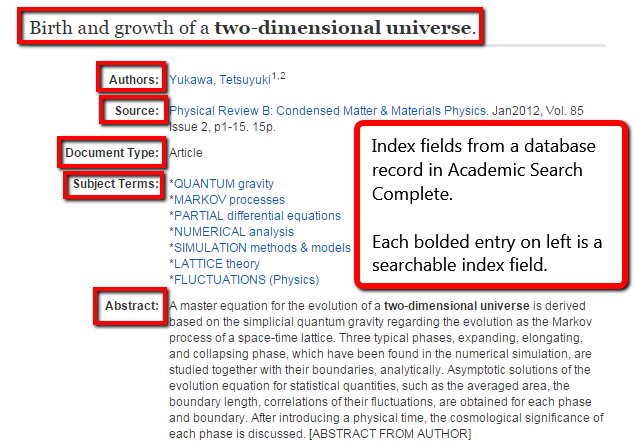 The Abstract field provides another option for searching for articles on two-dimensional universe theory. Limiters - database search tools that permit you to screen out unwanted records from a search result by selecting desired traits from a set of categories. Search Result - an itemized tally of records retrieved by a search strategy in a database. Search Strategy - a 'plan of attack' for finding information in a database.